The State Government after giving fifteen days notice by notification, of its intention so to do, may by like notification, alter the rate of tax specified in any of the Schedules, add to or omit from or otherwise amend the Schedules an thereupon, the Schedule shall be deemed to have been amended accordingly. Provided That if, State Government is satisfied that circumstances exist, which render it necessary to take immediate action, it may, for reasons to be recorded in writing, dispense with the condition of previous notice. Punjab Govt. 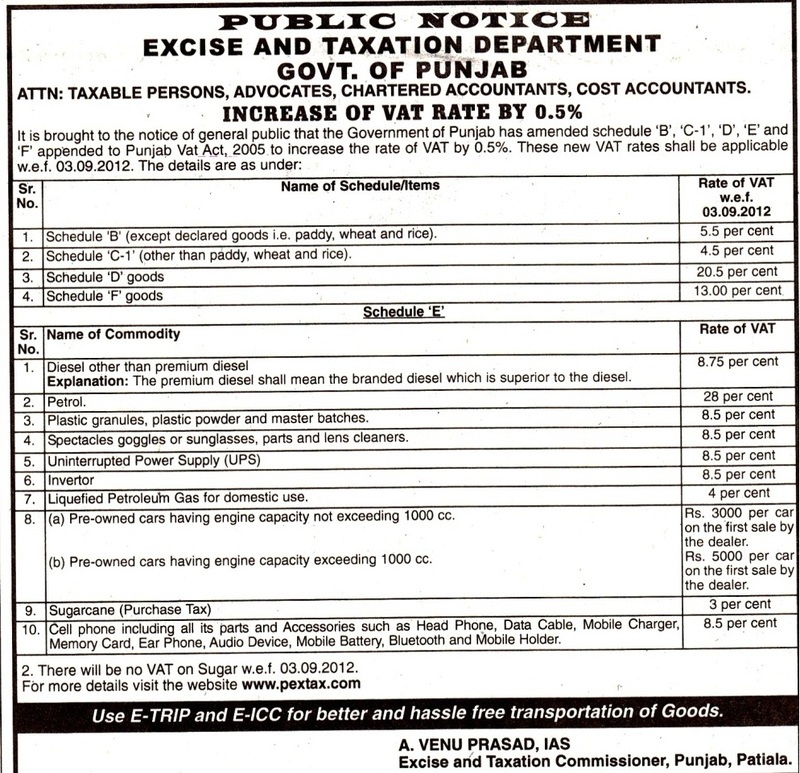 through Public Notice dated 02-09-2012 has increased the rate of tax w.e.f 03-09-2012. 1. Sugar: – The state Government is pleased to waive tax on Sugar w.e.f 03-09-2012. B. The rate of Tax on declared goods as mentioned in Schedule C-1 has been increased from 4% to 4.5% plus Additional Tax @ 10% and net effect from 03-09-2012 will be 4.95%. It is pertinent to clarify that on wheat, paddy and rice, there is no change in the rate of Tax w.e.f 03-09-2012 and the previous rate of Tax i.e. 5% will prevail, reason being maximum ceiling rate on declared goods is 5%. C. The rate of Tax on items mentioned in Schedule D has been increased from 20% to 20.5% + Additional Tax @ 10%. D. The rate of Tax on items mentioned in Schedule E i.e. Cell phones including all parts and accessories such as Head Phone, Data Cable, Mobile Charger, Memory Card, Ear Phone, Audio Device, Mobile Battery, Bluetooth and Mobile Holder :- 8.5% + Additional Tax @ 10%. E. The rate of Tax on the Residuary entry i.e. schedule F of Act, (goods not mentioned in any other schedule), has been enhanced from 12.5% to 13% + Additional Tax @ 10% net effect from 03-09-2012 shall be 14.30% (13% + Additional Tax @ 10%). F. The rate of Tax on Pre-owned cars having engine capacity not exceeding 1000 cc is Rs 3000 per car on the first sale by the dealer. And for the capacity exceeding 1000 cc is Rs 5000 per car on the first sale by the dealer. G. The purchase Tax on Sugarcane shall be 3% + Additional Tax @ 10%. H. The rate of Tax on Liquefied Petroleum Gas for domestic use shall be 4% + Additional Tax @ 10%. is vat rate on mobile and accessories is still 8.5%+10% (surcharge) AS ON DATE? please advise me regarding the applicable vat rate on fibres and fibre accessories used in vehicles (cars) including surcharge.